Recruitment advertisement is a process of advertising carried out in newspapers by the companies and business groups in order to make appointments in the vacant positions in the organization. A recruitment advertisement is designed with only one goal that is hiring fresh as well as experienced employees as per situation vacant for the job that is to be done. It should be compelling enough to draw the attraction of eligible candidates for the job and that is why the designing process of the advertisement should be efficiently done. Every day, the populace of the nation go through the recruitment section in search of the job that will meet their workings needs. So, it is always preferable to publish your recruitment advertisement in the popular dailies to get the best employees both India as well as foreign nations. It benefits both the employers and the employees. The design of the advertisement may be carried out by a non-specialist staff of the conglomerate or an advertising agency can be hired for this purpose. The recruitment advertisements are meant to be creating a good impression about the company among the masses and the companies generally try their best to raise the interest of the job seekers about the advertisement of the job opening. Recruitment ads are considered an important part of the whole recruitment process and the companies, therefore, use all the resources available to them to make the advertisement interesting among the candidates eligible for appointment. Bhaves Advertisers promises the best advertising services at low cost. 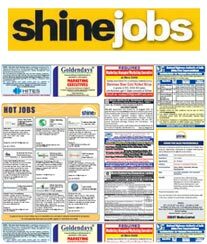 Grab the latest discounts from us and get your ads published in the top recruitment newspaper of India. Every newspaper decides the tariff of Recruitment Advertisements as per their circulation and readership. Therefore Recruitment ad rates will vary even for every edition of the newspaper. The higher the circulation the tariff rates also increases because you get more reach and readership. For most of the newspapers Recruitment advertisement tariff is charged per square centimeter. Therefore the cost of advertisement depends on the size you choose. Generally the minimum size accepted is 4x5 ie 20 sqcm and the maximum size is Full Page which is around 1700 sqcms. The cost of Recruitment advertisement even varies according to the page you select. If it is the front page of the newspaper, the charges will be relatively high compared to the inner page advertisement and even the minimum size of advertisement changes for the premium page. 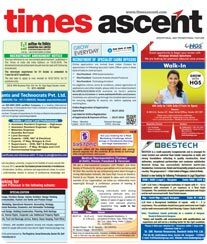 How to book Recruitment Ad in Newspaper? 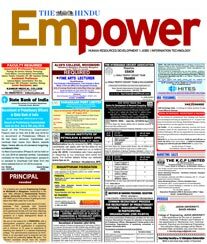 If you are sure about newspaper then directly search the newspaper and go to Recruitment page to check the advertisement rates. 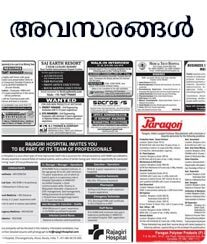 But if you are not sure about newspaper for your Recruitment advertisement then search the city in which you wish to advertise. 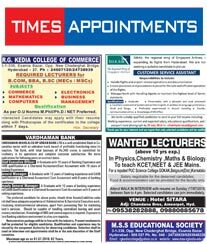 A list of newspaper would be displayed where you can publish Recruitment advertisement. The newspaper would be listed with higher to lower circulation for the city selected. Choose the newspaper with higher circulation and review ad rates for Recruitment advertisement. Recruitment advertisements are generally charged in Rupees per square centimeter in majority of newspapers. Fix the size of your Recruitment ad by multiplying with sq. cm. rate with the size you wish to advertise considering your budget. 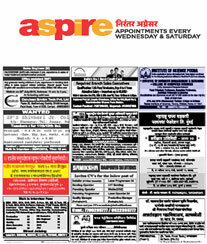 Plan schedule for your Recruitment advertisement by checking booking essentials mentioned in the newspaper page. Prepare a draft of your Recruitment advertisement content and send us to avail a free quote along with various discounts and offers to make your advertising experience pocket friendly. Upon receiving your consent on the Ad Rates quoted to you for Recruitment advertisement, we will send you an invoice with every payment options available. We are a national Advertising Agency having very strong network with all major newspapers in India. By utilizing this network and gathering data for Recruitment advertisements we have created a digital platform for newspaper advertising which represent the advertising details of Recruitment advertisement in an effective and simplified manner. This has become a great tool for advertisers to plan media in an effective manner while saving cost on advertising to get best the milage on spendings.